Lemax The Music Corner Lighted Facade from the themed Caddington Village collection depicts an illuminated music store with an array of viewable three dimensional shop windows. Lemax Music Corner is a flat-backed slim lighted shop building suitably placed in and amongst a seasonal Lemax village street scene. A popular Lemax Caddington Village collectable table piece that joined the Lemax collection in 2018. 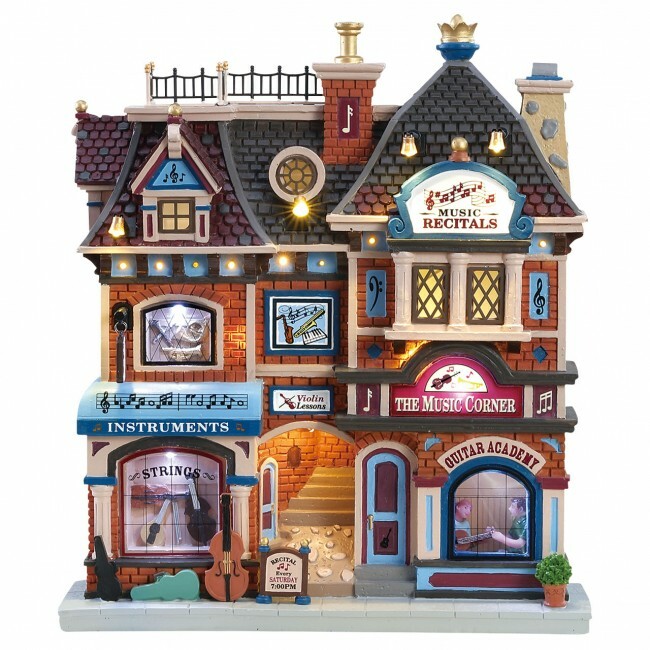 The Music Corner offers a delightful self standing building on an individual base to compliment your seasonal Lemax Christmas Village. Lemax Facades are flat-backed slimline illuminated buildings making a delightful addition to any room in your home, designed to be placed on a fireside mantlepiece, windowsill or bay window. Each building facade includes interior lighting, decorative exterior lights, and three dimensional window scenes. Caddington Village street building facades can be displayed individually or grouped in a village street setting. You can even hang these beautiful pieces on your wall.